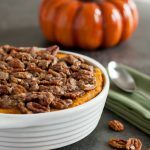 This Sweet Potato Casserole with Pecans recipe has been updated with new photos as of October 2016 as part of the #ThrowbackThursday photography project. 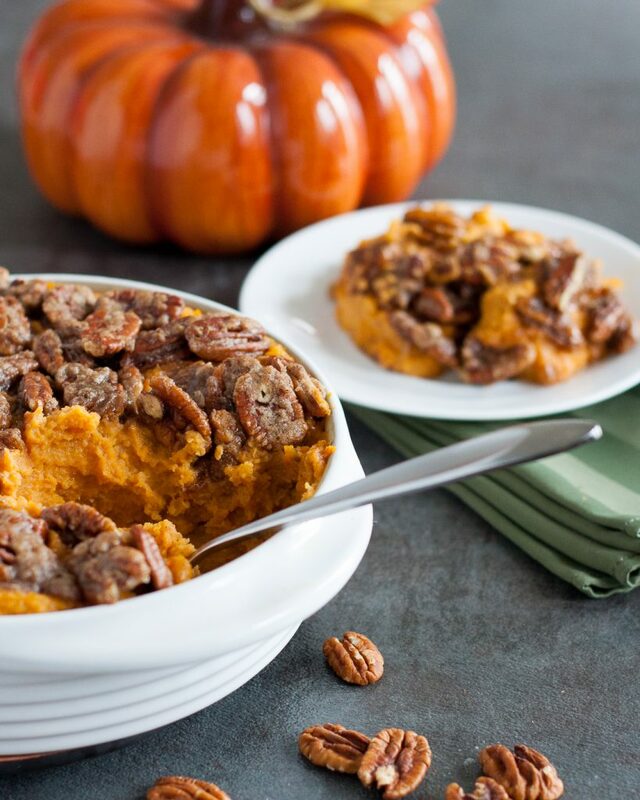 This recipe is a family favorite and has become a tradition in our home. 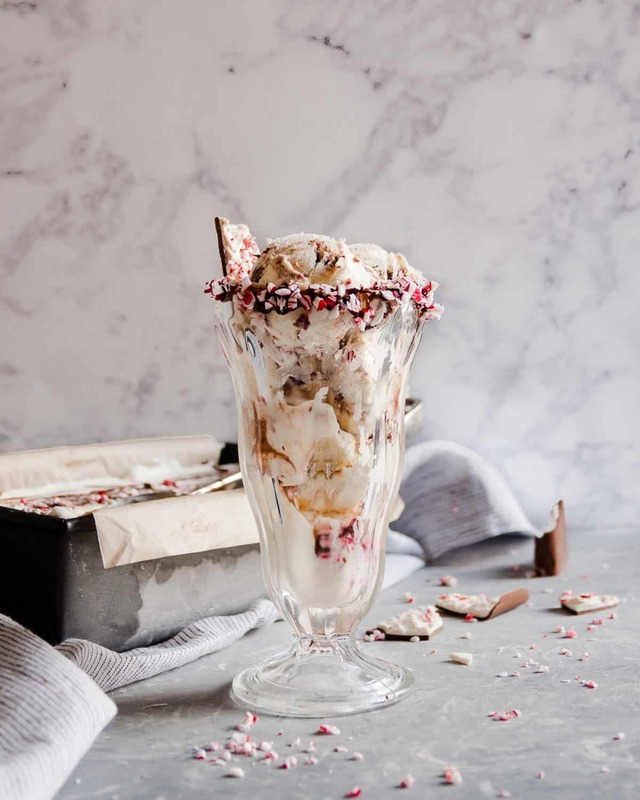 We enjoy it so much, I make it at least one or two times per year outside the holiday season. 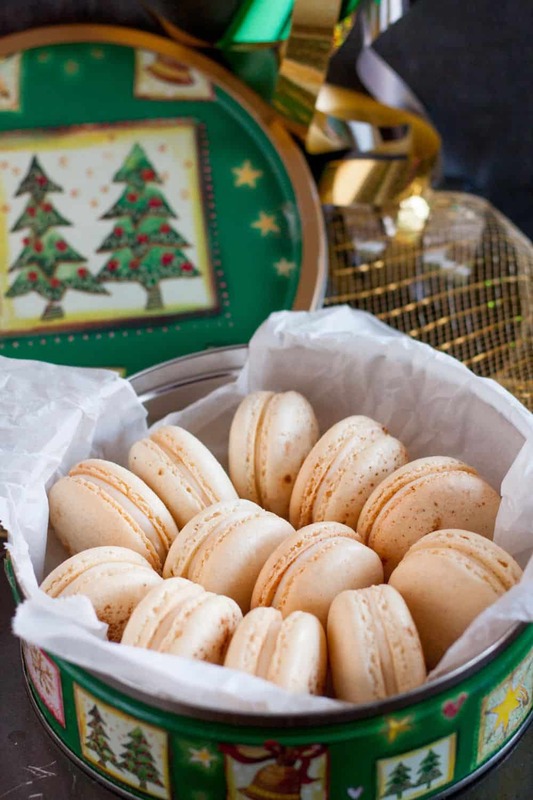 If you must add marshmallows for guests, I’ve used the same base and topped half marshmallow and half pecan with fabulous results. Enjoy, darlings! When I was a child, we usually ordered our Thanksgiving dinners from Publix. Read this blog long enough and you’ll notice we got a lot of things from Publix. Anyway, the dinner we would usually order included a few sides including stuffing, green bean casserole, and a marshmallow-topped sweet potato casserole that everyone seemed to love except me. FUN FACT – Sweet potatoes are actually edible roots and in the same plant family as morning glories. I first tried sweet potato casserole like this at a restaurant called The Swanson in Perry, Georgia. The Godfather worked with one of the owners and the place quickly became one of our favorite restaurants in the area. They had beautiful little buttery button biscuits, perfectly crisp fried chicken, and a sweet potato casserole topped with pecans. I was lucky enough to have the chance to speak to the owners about the dish and they shared a general outline of how it was made. 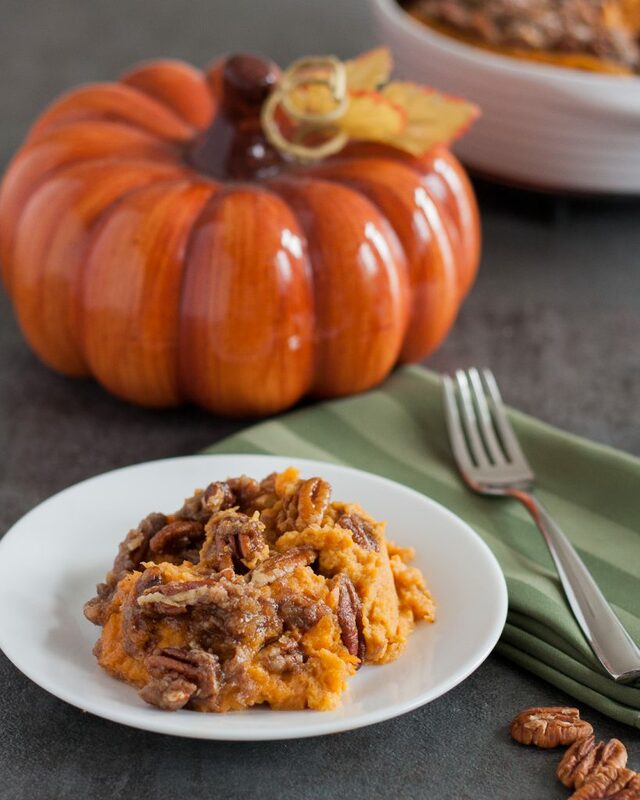 I took that outline and worked with it to create a version of sweet potato casserole I liked as our “family” recipe. 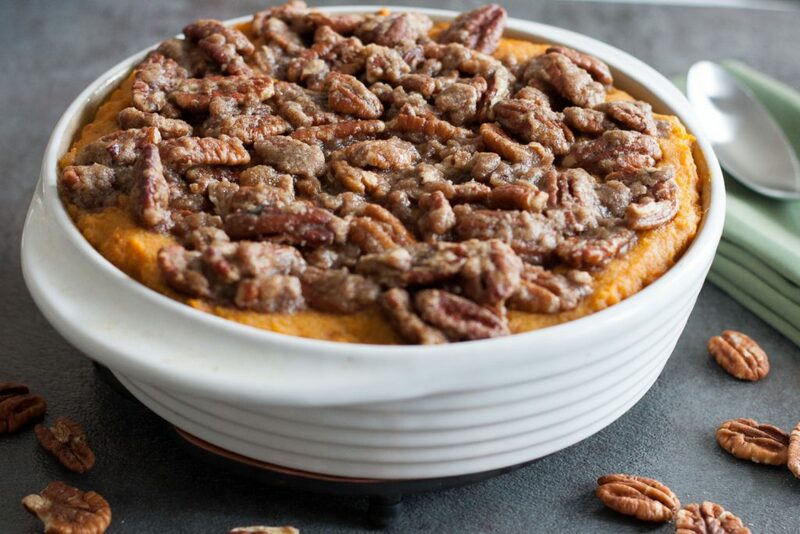 To keep it from being too sweet and to allow the beautiful natural flavor of the potatoes (yams) to shine through, I keep all the added sweetness to the pecan topping, and even that is primarily sweetened with a healthy amount of spice so the kitchen smells heavenly as it bakes! This definitely is a staple at our Thanksgiving feast, but we do make it other times of the year because it’s that good. I hope you enjoy! 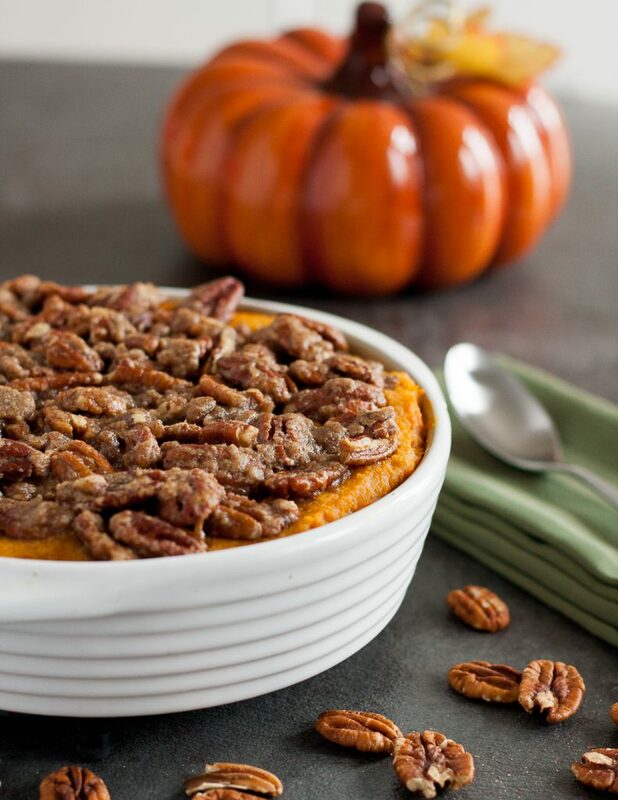 A less sweet version of the traditional sweet potato casserole topped with pecans for a little crunch! Cook the potatoes by either roasting at 400 F for 30-40 minutes in the oven. Alternatively, cook the potatoes in the microwave: pierce the potato skins all over with a fork, place on a microwave-safe plate, and cover with a wet paper towel. Cook at full power for 5 minutes, rotate the potatoes, and cook in intervals of 2 minutes until potatoes are done. Mine took 9 minutes total. 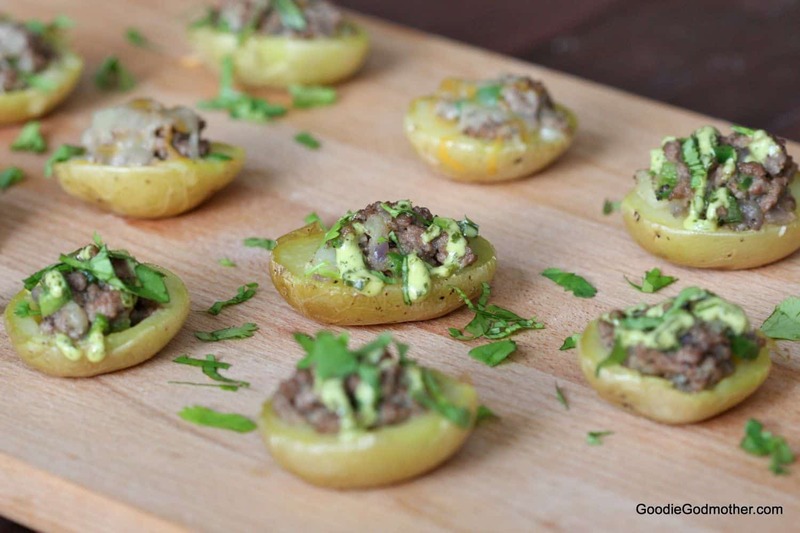 While the potatoes cool enough to handle, prepare your baking dish by greasing with a little butter or nonstick spray. I used a 7" round for a thicker casserole, but you may also use an 8x8" square. If you are doubling the recipe, I would use a 9" pie dish or 9x9" square, tripling the recipe would require a 9x13" baking dish. Once the potatoes are cool enough to handle, peel away the skin and place the still-warm potatoes in a mixing bowl. Add the butter, salt, and sour cream and mash together until you've reached a smooth consistency. Mix in the egg then transfer the potato mixture to your prepared baking dish and smooth the top. Melt the 3 tbsp butter. 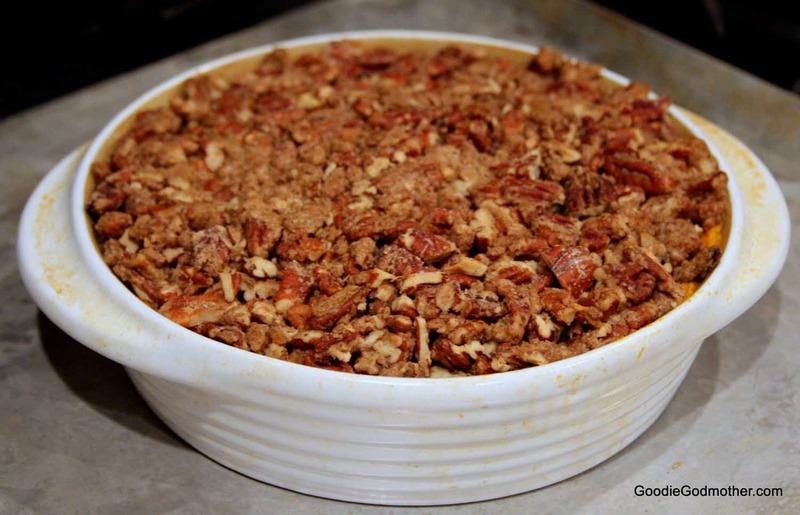 Roughly chop the pecans and place them into a bowl with the brown sugar, spices, and flour. Stir to combine. Add the melted brown sugar and stir to coat. 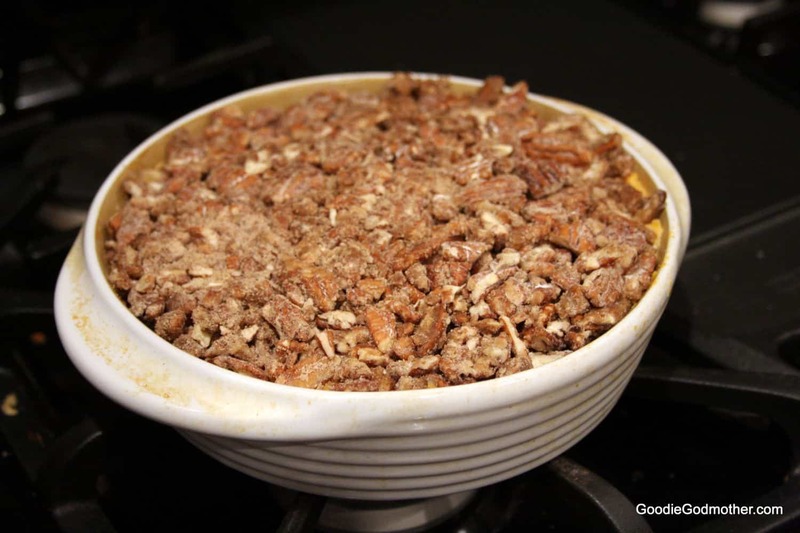 Evenly distribute the nut mixture over the potatoes and then bake, uncovered, for 30 minutes until the pecan topping is brown and toasted. Serve warm. The casserole can be made up to a day in advance and stored in the refrigerator until you are ready to bake. 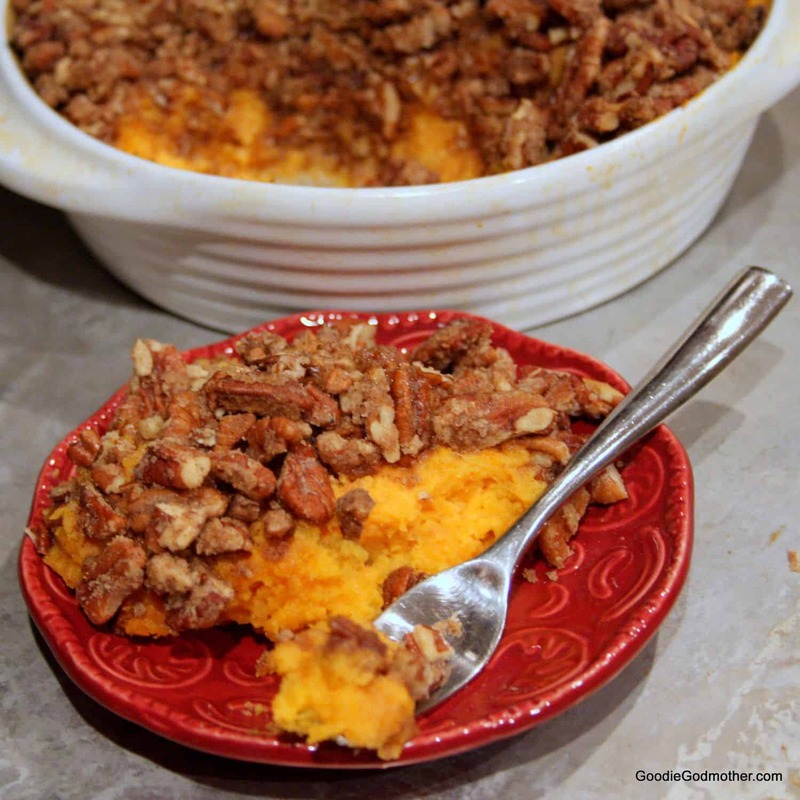 This potato casserole is awesome – tastes better than sweet – a perfect winter side dish!! 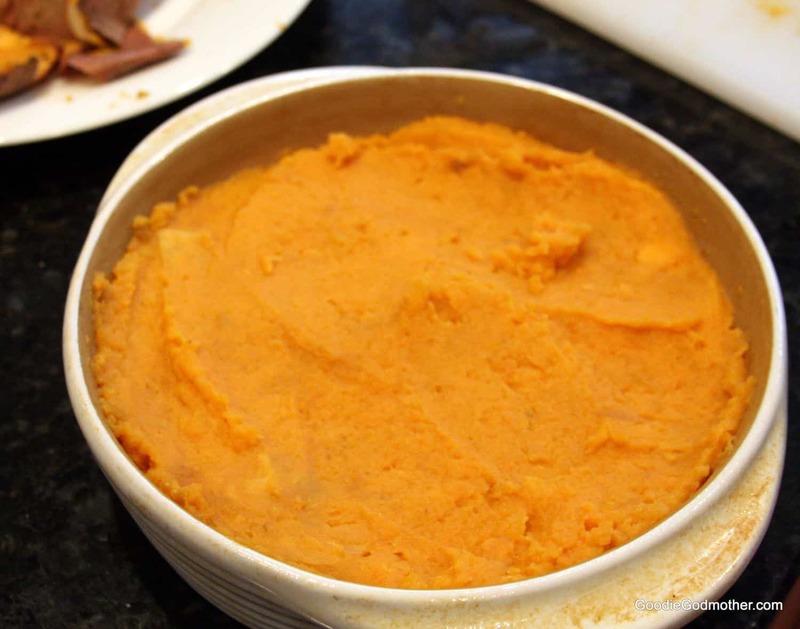 2 1/2 lbs of sweet potatoes gives you how many cups plz?